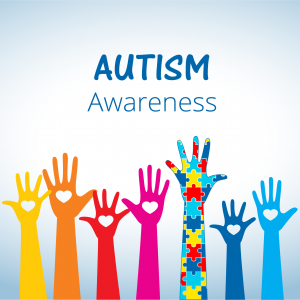 April marks Autism Awareness Month, a time to promote autism awareness, education, and acceptance, and to show support for the tens of thousands of young people and adults diagnosed with a spectrum disorder each year. Created nearly 25 years ago by the Autism Society, Autism Awareness Month is a growing initiative that has become a critical component of national efforts to help parents, educators, and friends understand the challenges of those on the spectrum and help those with a diagnosis lead their best possible lives. By learning about the challenges that students on the spectrum (and their families) face, teachers can be better equipped to adapt lesson plans and pedagogy to produce optimal academic results for autistic and spectrum disorder children. It is estimated that approximately 1.5 million people in the U.S. have an ASD, a set of developmental and behavioral challenges and issues that affect a person’s communication and social capabilities. The severity of such issues varies widely among those diagnosed, creating a spectrum on which an individual—particularly children—are diagnosed. Where a child falls on the spectrum is indicative of the types of behaviors they may exhibit. On the most severe end are those with autistic disorder, which is characterized by extreme behavioral, social, and communication inabilities. Individuals on this “high end” of the spectrum are considered to be lower functioning. On the opposite end are individuals with Asperger’s Disorder, those who demonstrate only mild behavioral issues and are more self-sufficient, capable, and higher functioning. According to the Autism Spectrum Resource Center, 20 percent of individuals on the spectrum have autistic disorder, while the vast majority fall somewhere along the higher functioning end of the spectrum. Be Clear With Instructions. Individuals with an ASD can think more literally and may not understand the subtleties of figurative language, physical cues, facial expressions, or sarcasm. When providing instructions to the class, be as direct as possible by outlining precisely the steps the students are expected to take and what the deliverables must be. Offer ample opportunity for all students to ask several clarifying or reassuring questions. Encourage Healthy Social Interactions. Students with ASD can struggle relating to their peers and may not always be comfortable in social settings. Enable pair and group work that will give your ASD students a structured opportunity to interact with others. Such experiences provide valuable opportunities for ASD students to learn appropriate social cues and behaviors. Structure Class Time. Students with an ASD are often most comfortable when they can rely on a repeatable routine and can feel anxious when anything causes them to deviate from a plan that gives them comfort. Keep class time structured so that your ASD students feel confident in the order of subjects and assignments and how much time they will have for each aspect of the day’s schedule. Incorporate Visual Aids. Students on the spectrum often find it easier to understand concepts when they are presented with visual cues. Where possible, incorporate visual aids, drawings, and pictures into your instructions to help convey new or complex topics or concepts. Be Patient. Students with an ASD often process information, particularly verbal instructions, differently than non-ASD students. Be patient if you ask a student on the spectrum a question and he or she needs time to process what is being asked of them before they respond, or they need you to repeat the question several times. Every student in your classroom is an individual, and every individual learns and processes information differently. By understanding, accepting, and adapting to the unique learning needs of students with an ASD, you give them the best opportunity to build their social confidence and exceed academically, no matter the challenges they face.